As a Brit I kind of mourn the relative dearth of great brand equity stocks in the FTSE 100. Even today you get a concentration in the Dow Jones Industrial Average of at least 20% that are basically branding powerhouses: Coca-Cola, Disney, Nike, Procter & Gamble, Johnson & Johnson and McDonald’s come to mind straight away. In the case of the FTSE stocks you get a similar number but out of a hundred, and even that will likely lose a member as SABMiller gets gobbled by AB InBev later this year. One of the few remaining UK listed brand giants is alcoholic beverage producer Diageo. If you were going to own one alcohol stock to hold for ever then it would be a toss up between this one and Jack Daniel’s producer Brown-Forman. Maybe Diageo would clinch it just down to the diversity of its brands but either way they’re both exceptionally high quality companies. 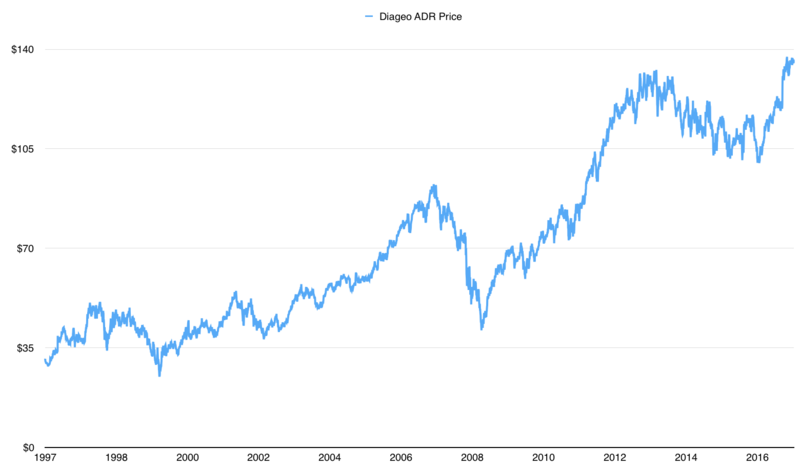 Now when you pull up Diageo’s stock price chart you might be tempted to start the journey in 1997 and leave it there. That’s ultimately the year that the modern day company came in to being following the merger of Grand Metropolitan plc and Guinness. The iconic stout beer brand doesn’t need much introduction – almost everyone is familiar with the brand whether they like it or not. Just to give folks an insight into how solid the company was though it was famously Warren Buffett’s and Berkshire Hathaway’s first significant foreign investment back in the early 1990’s. Buffett even likened it to Coca-Cola for its branding and international growth potential: not a bad long-term endorsement to have if you were a Guinness shareholder. Grand Met on the other hand was a mish mash conglomerate that you could broadly break down into food, alcohol and retail. Famous names that once came under their banner include Burger King and Haagen-Dazs ice cream. Around the time when Buffett was buying his stake in Guinness, Grand Met were pulling in 20% returns on net assets in the drinks division. It was by far the company’s most profitable segment, and through the process of eliminating the stuff that provided the least returns – plus the merger with Guinness – you get left with the profit machine that is the modern day Diageo. In short you have the number one selling Scotch brand, the number one selling vodka brand, the number one selling gin brand, the number one selling rum brand, and so it goes on. In terms of sales four of the top ten largest spirit brands come from the Diageo tent. That to me just screams stability of revenues, profits and dividends. Do you honestly see names like Tanqueray, Baileys and Guinness not being around in thirty, forty or even fifty years time? It would take something unimaginable to degrade the associate earnings power there. You don’t just get it in two or three brands either: their product portfolio is packed full of recognisable spirit labels. The other thing I’d add to that is how capital light the company is. It’s something that all the big brand equity stocks tend to have in common as well. In the case of Diageo you’re looking at capital expenditures to operating cashflow averaging about 25% over the past five years. In other words every year a huge chunk of after tax cash flow gets converted into owners’ earnings to be spent on dividends, buybacks, future acquisitions to boost growth or debt reduction. All the things that directly generate real wealth for stockholders over time. It’s in the same league as Brown-Forman – a stock that has been spending the last fifty odd years compounding at an annual rate of about 14%. In 2015 those Diageo stockholders were looking at a dividend check of £0.56 against a final year share price of £18.56: a yield of bang on 3%. In a few decades time what will the yield on cost look like for those who pick it up today? I’d find it hard to believe that the compounding machine that is the underlying business won’t be able deliver a solidly growing pile of cash to shareholders over that time frame. When Buffett was putting Berkshire cash to work in Guinness back in 1991 you could pick the stock up for about 16x annual profits. That’s great long term value for what he described as the beer equivalent to one of the greatest stocks of all time. Grand Met shares were going for even cheaper at 13x earnings. Interestingly you could also get your hands on Brown-Forman stock for 15x annual earnings (and a 2.8% yield) that year too – imagine the wealth creation on that as an investment! How does Diageo compare today? On paper the rocket ship that was Brexit has sent Diageo’s London listed shares up about 17% from the pre-vote trades to 24x prior year earnings. On paper in the sense that plummeting sterling will boost the accounting figures rather than anything material with the underlying business. In a world where premium quality is demanding premium prices the fact Diageo was trading at under 20x earnings at points in the year is the functional blue chip equivalent to value territory. Assuming it doesn’t get picked off along the way by some mega 3G/Buffett type deal investors should be reaping the cash flow for decades to come. It’s all down huge brand equity that will likely be sustaining demand for bottles of Smirnoff Vodka and Captain Morgan rum, created and acquired over the years by the likes of Guinness and Grand Met, and now to be cultivated and enhanced by the modern day Diageo. Sadly their kind is now becoming a rare breed on the British exchanges.